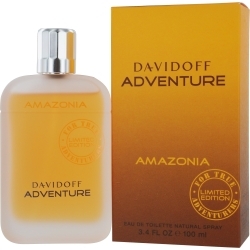 Adventure Amazonia is a distinctly exotic men's fragrance, bringing to mind imagery of far-off jungles and wild, untamed lands. Introduced in 2009 by the designers at Davidoff, this thrilling scent is designed for men who desire adventure and excitement. It features bright citrus and spice top notes, creating an attention-getting opening. Palm tree leaves and wet notes precede smooth base notes of Peruvian cedarwood. Reach for Adventure Amazonia when you are longing for the feel of foreign soils.